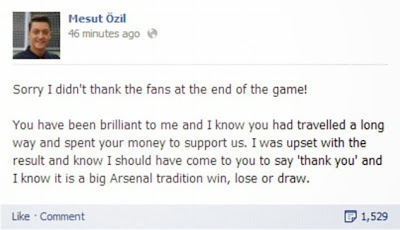 Arsenal star Mesut Ozil has said sorry to the Arsenal supporters he ignored at the end of Saturday's humiliating away loss to Manchester City. Thousands of Gooners had made the trek north for the lunchtime kickoff, only to watch their Premier League-leading side ship a shocking half-dozen goals. When the final whistle blew and his teammates headed over to the away section of the Etihad to thank the fans for their support, Ozil infuriated captain and fellow German Per Mertesacker by making straight for the tunnel. Later, Ozil - the Gunners' club-record £42million summer signing from Real Madrid - made a full apology via Facebook. “Sorry I didn’t thank the fans at the end of the game," he wrote. “You have been brilliant to me and I know you had travelled a long way and spent your money to support us.